I really wanted to make some bright and fun Christmas cards this year as the past few years I have bought paper pads that were a lot more subdued. Even again this year, the first paper pad I bought wasn’t as bright as I had hoped it was going to be, as the front cover of the paper pad was very bright but the paper wasn’t, very disappointing. 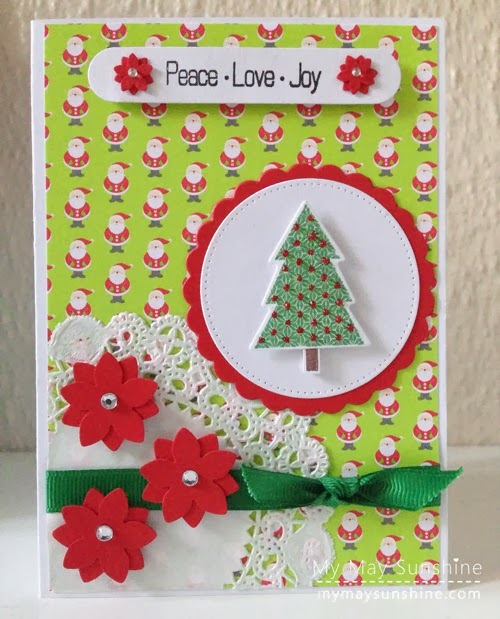 So I decided to purchase the Doodlebug Home for the Holidays paper pad as I had seen it in a haul that Michelle from The Card Grotto did and it was just what I was looking for. I am a big fan of the colour red so really wanted to pick out the red of the paper and use it for the scallop circle and the flowers. The flowers are made with 2 punch shapes to make the flowers look fuller and then added a gem to the middle to add some bling. Love them. To add some more sparkle, I added some red stickles to the tree to continue the red theme. It is definitely the brightest card I have made recently! I decided to use the sketch #89 from Retrosketches for this card. Also as the Clearly Besotted challenge was Christmas, I thought I would enter it there too!